RIO VISTA, CA - MARCH 25: California Department of Fish and Game workers monitor a pipe as they release fingerling Chinook salmon into the Sacramento River on March 25, 2014 in Rio Vista, California. 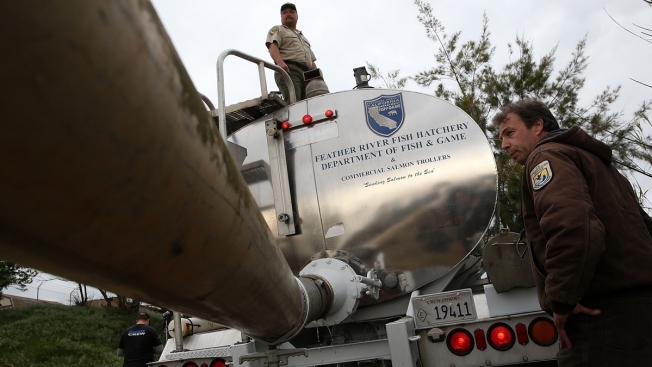 As California continues to suffer through its worse drought in history, low water levels on the Sacramento River have forced wildlife officials to truck more than 400,000 fingerling Chinook salmon from the Coleman National Fish Hatchery in Anderson to the Sacramento River in Rio Vista, a nearly 300 mile journey. The fish usually make the trip on their own but would risk be targets of predator fish.